Jauja (pronounced how-huh, in case you were wondering) is not a film for the impatient. Or even the moderately patient, come to that. Lisandro Alonso’s period drama, which is set in Patagonia during the ‘Conquest of the Desert’ (a military campaign in the 1800s to rid the South American region of aboriginals), trudges along with deliberate sluggishness, stretching out each and every scene as if it were made of non-breakable elastic. To the Argentine director’s credit, these prolonged sequences are befitting of the seemingly endless journey that Danish captain Gunnar Dinesen (Viggo Mortensen) finds himself on as he searches the desert for his missing daughter, Ingeborg (Viilbjørk Malling Agger), who has ditched her father to run off with a fetching young soldier. But for all intents and purposes, this is a film devoid of many of the ingredients it strives to include. As Dinesen traverses the barren terrain, encountering characters of a sometimes hostile and invariably enigmatic nature, I found myself embarking on my own taxing quest: to avoid nodding off. The film’s mind-bending narrative could have been far more captivating than what we end up with; aside from a couple of memorable scenes (one involving a horse hijacking, the other Dinesen’s descent into a mysterious cave), Jauja fails to evoke much intrigue and rarely makes us look far beyond the fact that we’re watching a man wander across a desert for nearly two hours. If you think that sounds dull, you’d be right. What saves this from being a complete snooze-fest is Alonso’s inspired decision to shoot Jauja like the films of old (on 35mm film and in 4:3 aspect ratio), resulting in a wonderfully vibrant spectacle that retains the feel of a classic western. The desert has probably never looked so good. 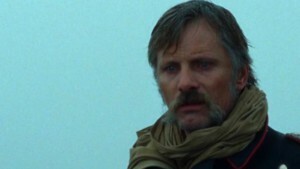 Viggo Mortensen’s relatively commanding performance is another plus point, especially given that he’s a solitary figure for much of the film – though because of a lack of insight into the relationship between father and daughter (not to mention a real lack of characterisation altogether), we can never really emotionally invest in his personal struggle. While some may ultimately be put off by Jauja’s dream-like ambiguity, that shouldn’t be seen as the issue here. The beauty of cinema is that it allows for unanswered questions and underlying meanings, and the film certainly flirts with some interesting themes. The problem is that it shouldn’t feel like such a laborious watch in the process. Jauja may require a commendable measure of patience, but it barely rewards those who have it.